What is Utility Model protection and does India offer utility model protection? Like patents, utility model is an exclusive right granted to an invention. This allows the grantee, the right to prevent others from commercially using the protected invention, without the grantee’s authorization, for a limited period of time. It is very similar to patents and are often referred to as, “petty patents” or “innovation patents”. As compared to patents, the requirements of obtaining a utility model differ. To obtain patent protection, patents are required to satisfy both novelty and non-obviousness requirements of patentability among other requirements. Utility models are supposed to satisfy the novelty requirement and the non-obviousness requirement for utility model is low or absent. The term of protection for utility model is usually between 7 to 10 years, based on the jurisdiction. In most jurisdictions offering utility model protection, the applications are not examined prior to registration. This significantly reduces the duration required for registration. As compared to patents, utility models are cheaper to obtain and maintain. In some jurisdictions, utility model protection can only be obtained for certain fields of technology and only for products but not for processes. For inventions that do not reach the same level of inventiveness, which is required for patent protection. For inventions that require faster registration. For innovations which are of incremental nature and do not meet all the requirements of patentability. When the life cycle of the invention is short and/or if, the profits are not able to cover patenting costs. For minor improvements and adaptations of existing products. The innovation is tangible and/or mechanical in nature. Many may identify themselves under the above mentioned criteria and feel that, their innovation warrants a utility model protection and not patents. But all countries do not offer utility model protection. Below is a list of countries, which offer utility model protection. Though utility model protection would be of great help to many, India, at present does not offer protection under utility model. At present, technological innovations can only be protected in India under patents. Using Patents as a Marketing Tool – Good, Bad and the Ugly! Marketing is one of the core functions in any business. This core function is carried out by working in conjunction with other functional units of companies. Working in conjunction with other functional units has known to help marketing teams in capitalizing on various aspects of the company to build brands and facilitate sales. One of the aspects that is being used increasingly over the past few years is patents. Using patents in marketing helps in sending across a wide range of messages. We recently conducted a survey to understand consumer perception when they recognize that a product is protected by a patent, be it through an advertisement or through information provided with the product itself. I agree with the first perception to a large extent. The fact that a company has a patent granted, illustrates that the company has, at least to some extent, invested in innovation. Further, the company has long term (it generally take around 3.5 to 4 years to have a patent granted) vision in protecting their innovation. Hence, a perception that a company is innovative can be agreed upon. Further, as pointed out earlier, consumers perceive that a patented product is superior; this perception appears to be rather strong. However, while some patented products may be superior compared to other products in the market, it may not always be true. In over simplified terms, one can say that a patent was granted to a product or a process because the product has a feature or the process has a step that was not known to the public, prior to inventing the product or the process. However, it does not necessarily mean that the new feature or the process step is superior than the existing features or processes. Hence, a sweeping statement that a patented product is superior may not be accurate. While I have some objections with the second perception, I completely agree with the third perception. The patented product would be unique, at least to some extent, as compared to other products in the market. However, having an opinion that a patented product has some breakthrough innovation in it, may not be correct, considering that most innovations are incremental in nature and not breakthrough. The innovation in the product, be it incremental or breakthrough, the fact remains that the product is unique, as the product cannot be copied, since the product is protected by a patent. The common understanding among consumers that a patented product cannot be copied by other, and hence the product remains unique, appears to be greatly abused by marketers. Consumers to a large extent are not aware that patents are jurisdiction specific. In other words, a patent granted in US and not in India, cannot be enforced in India. Which means, if a patent for a product is not granted in India, and is granted only in the US, then anyone in India can copy the patented product without being liable for infringing on the rights of the US patent holder. I recently came across one such advertisement, which I think was trying to take advantage of incomplete understanding among the consumers about the patent system. The advertisement appeared in Times of India (TOI), Bangalore edition and was also found in TOI Mumbai edition. Image of the advertisement in the Mumbai edition is provided below. 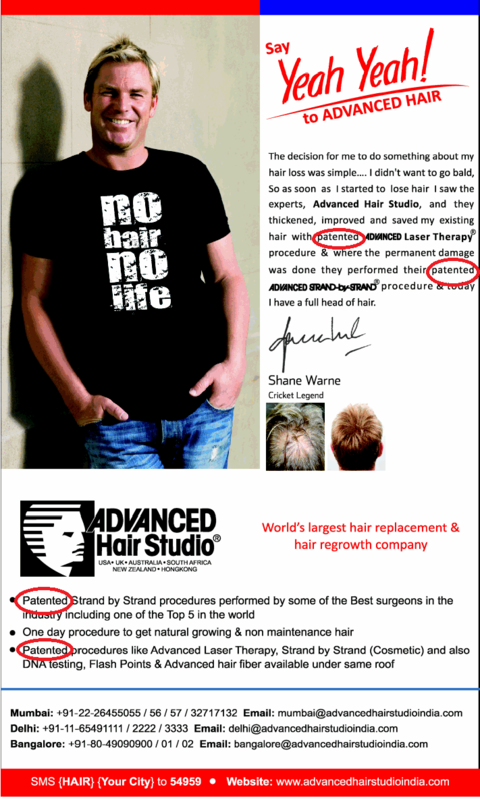 The advertisement is from a company called Advanced Hair Studio, and endorsed by Shane Warne! The advertisement stresses a lot on patents, with the word “patented” appearing 4 times in the advertisement, out of which, twice the company has used the word “patented”. Since, they have stressed substantially on patents, we wanted to find out the patent portfolio covering their technology. Surprisingly, while they have a few patents outside India, they don’t seem to have a single granted patent in India! The advertisement gives an impression that their technology is protected by patents in India. However, considering that one of the most important aspects of patents, which is the jurisdiction in which it is granted, the advertisement should have mentioned that the technology is not protected by patents in India. Such usage of the word “patented”, commonly known as “false marking” may be interpreted as an effort to deceive the public. False marking is punishable in most countries, and in India (Indian Patent Act – Section 120), a fine extending up to INR 100000 (~$2200) may be imposed for such an offence. While, the extent of fine may not deter most companies from adopting false marking strategy for marketing, at least the knowledge that such practice is considered unethical, should stop them from adopting such strategies. To sum it up, using patents as a marketing tool has a lot of positive effects on consumers. Hence, while marketers might use this strategy, ethical or not, to their advantage, consumers should absorb such messages with a pinch of salt. I hope this article helps in increasing knowledge about the patent system among consumers in general, and markets in specific. Feel free to contact us (contact@invntree.com) or ask us a question and have it answered within 24 hours. Check our patent services page to find out if we cater to your patent requirements. We specialize in offering patent support services to patent practitioners across the world.